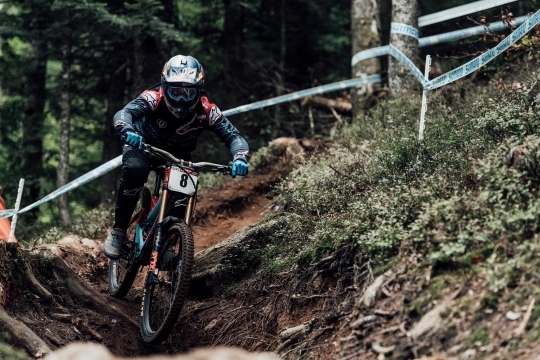 Brook Macdonald powered his way down a mud-laden course to claim third place in the final round of the UCI Mountain Bike World Cup in La Bresse, France. The MS Mondraker Team rider, fourth fastest in qualifying, produced an outstanding ride in the testing conditions to finish third behind Belgium’s Martin Maes and Britain’s Gee Atherton. It's the second podium in the World Cup downhill competition this year for the Hawkes Bay rider, who has finished sixth overall on the standings, just 4 points away from 5th. It's been a consistently competitive season in his return to the MS Mondraker Team with five top-11 finishes and real confidence going into next month’s World Championships in Lenzerheid, Switzerland. MS Mondraker was MacDonald’s first factory team, and his return full circle has gone with a return to high quality form throughout the season.